Posted Jan 10, 2018 by Eds. The recent controversies about Oxford Professor Nigel Biggar’s “Ethics and Empire” project and UK Universities Minister Jo Johnson’s attack on “safe space culture” have both been defended on freedom of speech grounds. However, they are better understood as retrenching colonial thinking in universities. Nigel Biggar’s research project proposes to take a cost-benefit analysis of British imperial history, weighing the bad things against the good. In defending the project he called on “us British to moderate our post-imperial guilt” (emphasis added) in an article in The Times. There have been some excellent critiques of the naive simplicity of the research methods proposed, most notably an excellent open-letter drafted by a range of prominent Oxford academics of different disciplinary backgrounds. This led to a backlash from right-wing newspapers against these academics. A British officer in India receives a pedicure from an Indian servant. For me, any defence of British imperialism is by implication a defence of white supremacy. To take the example of British India—my own field of study—there were always exceptions and protections for white populations written into the laws. Similarly in the political sphere there were always positions of authority reserved for white rulers only. Elizabeth Kolsky’s amazing book on white violence in colonial India is a great place to learn more about how these privileges operated. To judge British colonial rule by its effects without taking into account its fundamentally racist legal and bureaucratic structures is to suggest that there are circumstances when white supremacy is acceptable. The argument that positive things were done through British imperialism that might excuse its inherent racism (let alone the numerous atrocities committed by British colonial regimes across the world) is, thus, also a subtle defence of white supremacy. 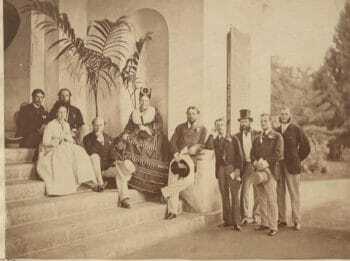 Group on the Pavilion Steps, Ceylon. National Acrhives CO 1069/569. The claim that colonial rule did good because it “developed” colonized societies (with proponents of this position often citing improvements in medicine and infrastructure) rests on the implicit counter-factual that without imperial intervention these societies would not have participated in modernity. The assumption here is that pre-colonial polities were stagnant, static and disconnected from wider historical changes. This is an assumption that work on pre-colonial histories have shown to be demonstrably false. For instance, Victor Lieberman’s colossal comparative global history shows that there were parallels between Europe and other parts of the world prior to 1830. Moreover, colonized people engaged with modern practices without the direct instigation of the colonial regime, and sometimes in the face of imperial opposition. The assumption that the apparently “positive” changes that occurred during colonialism can be attributed to the British presence is unsustainable. It implies that only white rulers could have brought about these changes. However, the assumptions, which are apparent in Biggar’s approach, are commonplace. When I teach the history of imperialism to British undergraduate students I often find that they initially hold the opinion that the Empire must have done some good, and that this should be taken into account for a balanced approach. Sometimes students also express some guilt or shame about Britain’s colonial past. Both the “balance-sheet” approach and emotional response can make it challenging to encourage students to think critically about imperialism—by which I mean analyze imperial history using the critical analytical methods developed in recent scholarship, not crude Empire-bashing. The problem is that students have an identification with the British Empire. The identification is the same as that invoked in Biggar’s article addressed to “us British” and “our post-imperial guilt”. This is where “safe spaces” comes in. I am in favour of safe spaces. They are necessary because students and staff from underrepresented minority groups often face a host of challenges at universities that make them vulnerable, as the 2015 Runnymede Trust report into Black and Minority Ethnic experiences in the academy shows. However, the idea of a “safe space” can be mobilised to further marginalise minorities in classrooms. In a Masters degree module called “Approaches to Race” we read an article by Robin DiAngelo and Özlem Sensoy about the ways in which white students used the notion of safe spaces to depict students of colour as aggressors when discussing racism. In what is usually a multi-racial seminar, the piece never fails to stimulate a discussion. Our Black and Asian postgraduate students usually recognise the discussions covered by DiAngelo and Sensoy’s research. They also often mention incidents in seminar discussions of race when they felt their presence in a classroom become particularly conspicuous. White students, by contrast, often note how unaware of their race they have been throughout their education, even when they have studied subjects in which racism has been a central point of discussion. Reflecting on these classes, I have thought again about my undergraduate teaching, in which the classes are overwhelmingly white. In attempting to make students feel validated in their contributions and comfortable expressing their views—in short, trying to make them feel safe—I have not consistently confronted their identifications. White British students are able to occupy a normative position in seminars which on occasions involves an unacknowledged identification with the Empire. I find students regularly refer to British colonial rulers or Victorian British society as “we”, unthinkingly. All too regularly students use homogenizing terms like “natives” to refer to colonized peoples. This doesn’t mean that they are necessarily pro-imperial. In fact, more often than not the contrary is the case. But the racial divisions of Empire operate subtly in today’s classrooms. Making seminars safe for students whose cannot occupy this normative position means confronting these unintentional identifications and their implicitly exclusionary effects. Identifying with the British Empire is different from acknowledging how as individuals or as a society we may be connected to the imperial past. It is different from, and may even inhibit, a will to take responsibility for these connections. An identification with British imperialism means that a critique of Empire can be felt as an attack on an aspect of one’s self. To condemn the Empire is equated with attacking the nation, or it is read as a pious attempt to make people feel guilty for their past. The backlash from the right-wind media against the academics critiquing Biggar’s flawed project reveals this sensitivity operating in the public sphere. Jo Johnson’s criticism of safe spaces can also be considered in this light. The implication that minority groups may require additional security to participate in higher education is read as an attack on (implicitly) white students’ right to express themselves. DiAngelo and Sensoy refer to these dynamics as “white fragility”, a mindset in which any pressure on white identity results in defensive responses. While their research context was the U.S., the point holds for white British identity too. I’d argue that British universities are already safe spaces for colonial apologists. There is a popular reluctance to confront the Empire as a white supremacist force that irrevocably disrupted the historical trajectories of the societies that it subjugated. And there is also a reluctance to take the necessary steps to make universities safe for students of colour. In this context the furore about Biggar’s project and Johnson’s policies should not be considered debates about freedom of speech; they are battles over the decolonization of universities.